So I had this last-minute flash of inspiration to take a song title, beginning with each letter of the alphabet and 'tweaking' the lyrics to fit an A to Z theme. (The song portion begins at approx 2:22). 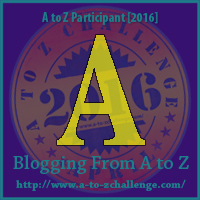 My A to Z, yeah, my A to Z. Then I could go visit my friends' blogs! I'm stressing over all the wri-ting. Who will make it real ex-ci-ting! If you follow me here or on social media, let me know so I can follow you back. Let's DO THIS THING! What a fun theme, LuAnn! :) You had me smiling, LuAnn! What a clever theme! Your verse is delightful - and I come bearing snacks to fuel you! Hey, Vidya, anyone bearing snacks is ALWAYS welcome at my place! Thank you for your kind words. Now that's really clever! I'll let the other co-hosts know so they can read it. Oh, that is so funny! That song takes me right back to when we used to listen to the forces request radio programme during Sunday lunchtime. That was a favourite - along with "I'm a pink toothbrush, you're a blue toothbrush" . I wonder if anyone else knows what I'm talking about! *heheheh* Well, I haven't heard about that, Jemima, but I'm sure someone in the AtoZ Universe knows! Your comment makes me think about this old mystery program that was on radio that I loved to listen to! Thanks Richard, I appreciate you! This was great! Good job, wHooligan! LOL That is a great way to start the challenge.